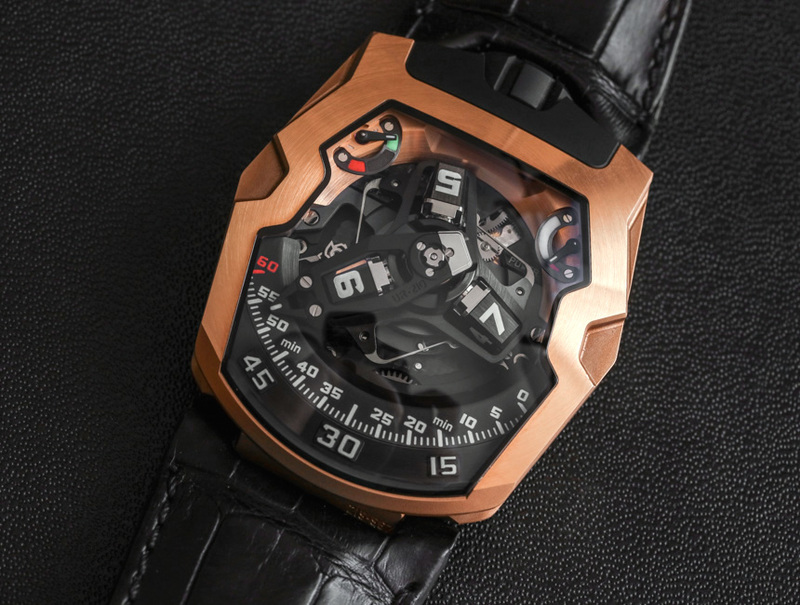 First debuted in 2012, this will be the eighth article now published on aBlogtoWatch regarding Urwerk’s UR-210 watch model, and the first full review. 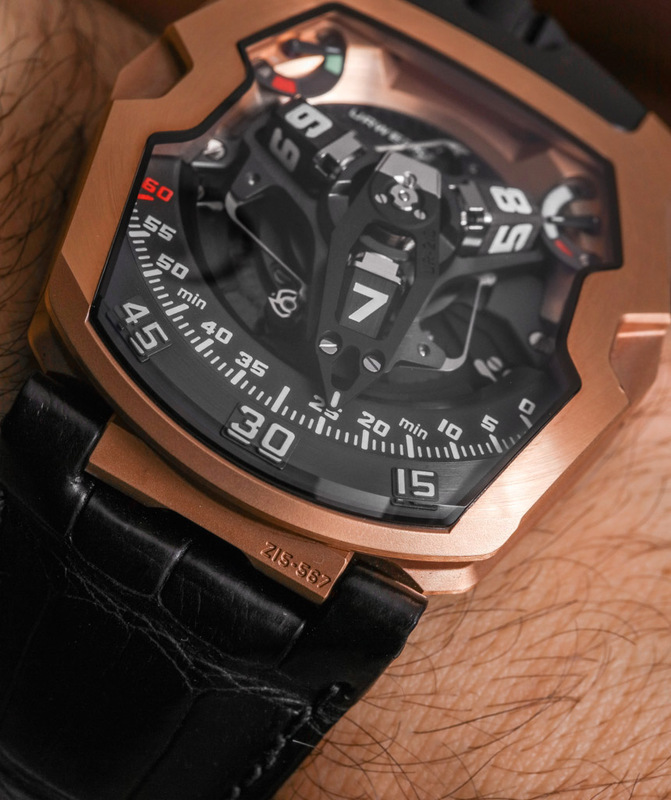 On my wrist is the Urwerk UR-210 RG, with “RG” standing for 18k red gold – the primary case material. The most recent version of the UR-210 that we covered was an interesting piece unique (one of a kind) model known as the Urwerk UR-210 Amadeus – which boasts a fully hand-engraved case and bracelet. Most versions of the UR-210 come in steel, which makes this red gold model the odd man out. While precious metal Urwerk timepieces are by no means new, conspicuously precious metal-cased Urwerk timepieces come second to those in more practical metals such as steel and titanium. Of course, that isn’t about money savings, since we are talking about watches which average perhaps $100,000 each. It is really just about the theme and focus of the brand, which isn’t old-world luxury but futurism meeting mechanics. While I don’t personally lust after ever Urwerk timepiece out there, I have often said that the UR-210 is one of my top choices if I was to choose a watch from the brand. This is mainly because of both the case shape, as well as the complications and how the time is displayed. 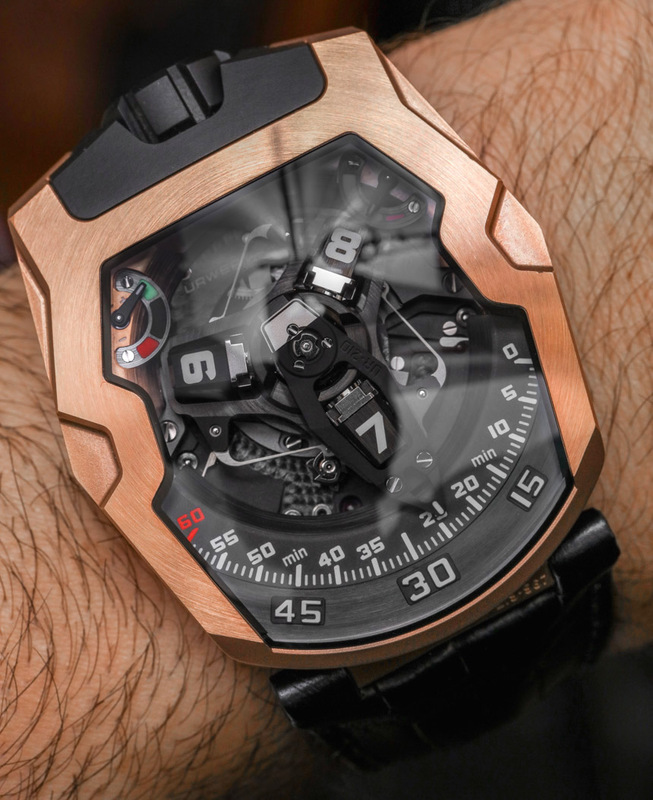 The symmetrical case is attractive and comfortable to wear, while the complications are for the most part practical. More on that in a bit. Visually speaking the UR-210 has its own character within Urwerk’s larger assortment of models, but it also has a bit of a distinctive look to it. 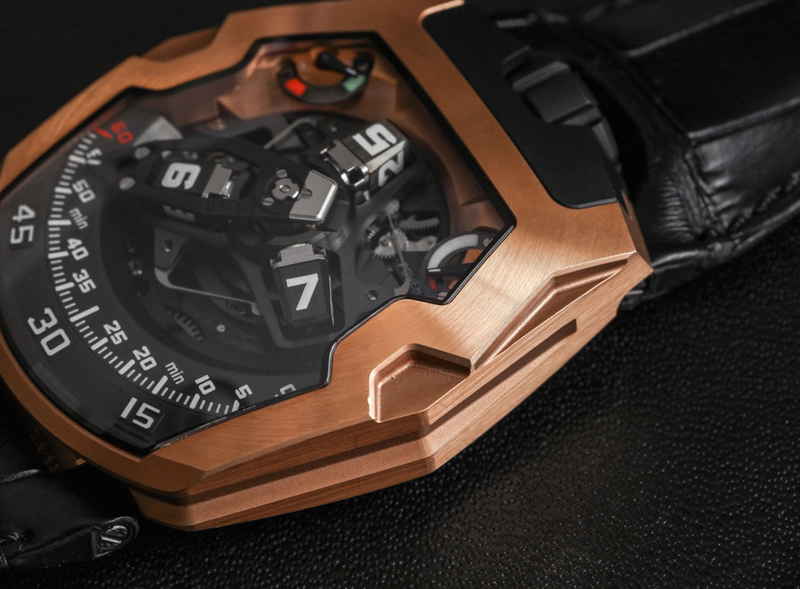 I think Urwerk got the length versus width proportions right, along with the overall design of case. On the wrist the case is 43.8mm wide and 17.8mm thick. The more important measurement is the case length, which in this case is 53.6mm. That is the measurement you’ll care about the most when determining if this can fit on your wrist. 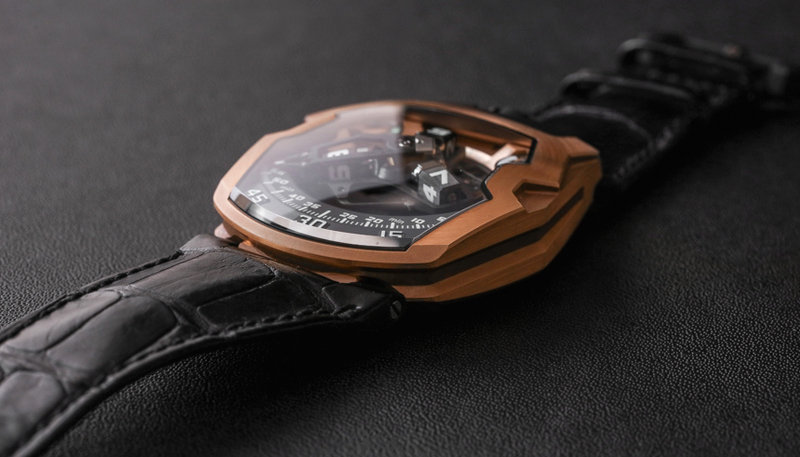 Urwerk supplied this watch with a shorter strap for my smaller wrists – which I appreciate. 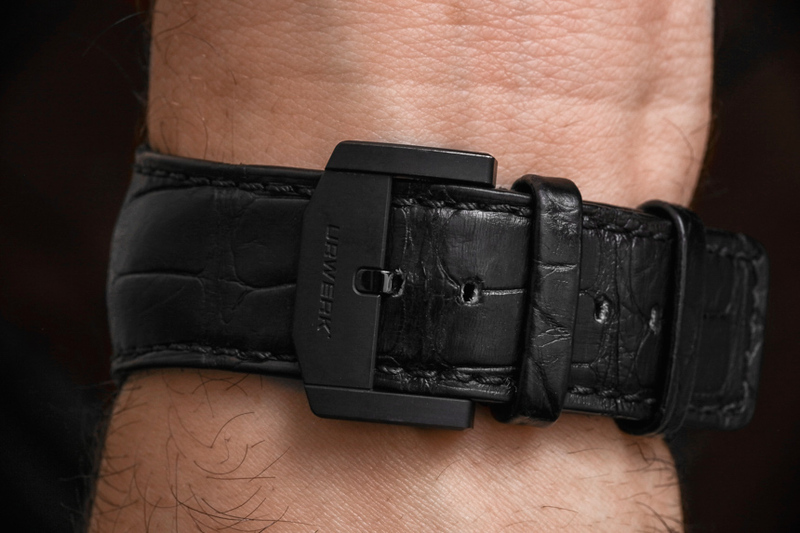 Given the thickness of various parts of this very good looking black alligator strap, I would encourage anyone interested in this watch to double check to make sure the included strap works for their wrist. If it doesn’t, the wearing experience might not be as comfortable. I mention comfort so much because I think it is worth mentioning each time a case shape is not a standard round shape with traditional lugs. Here, the lugs are set down toward the bottom of the case, underneath the primary case, which helps make the watch positive from an ergonomic perspective. Detailing on the case is good, with a mixture of angles and lines which keep it interesting from most views. 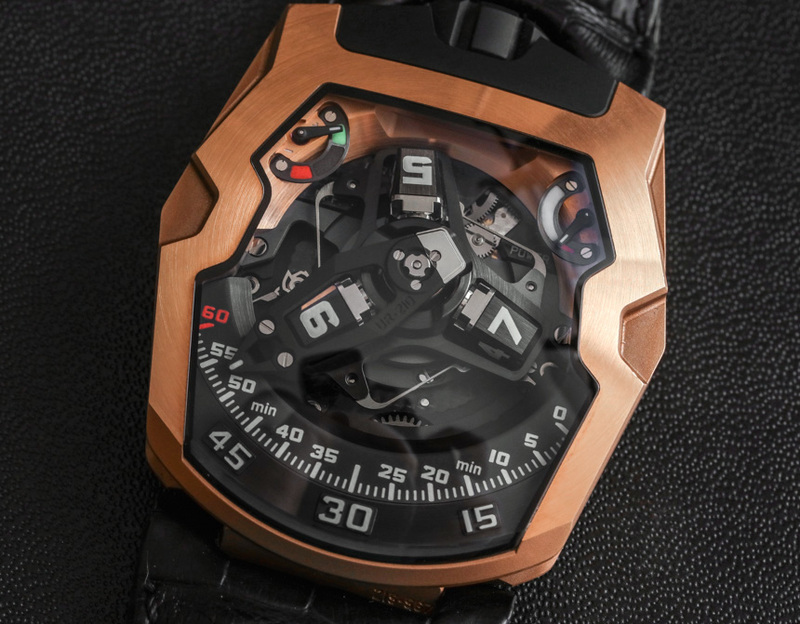 The majority of the case is brushed 18k red gold, while matte-finished black-colored titanium pieces are used for the caseback as well as the crown assembly. The crown itself is placed at the 12 o’clock position on the case, and it is thankfully large and easy to wind while the watch is still being worn. Though as an automatic watch, you don’t strictly need to wind it all the time. 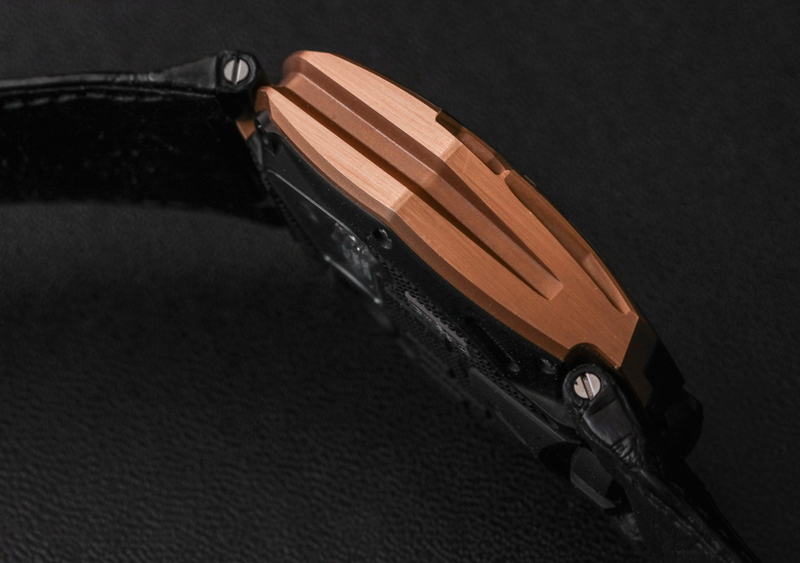 Compared to the red gold part of the case, the black titanium caseback actually has a lot more visual details, including a small sapphire crystal window to the movement, as well as a round finger-operated switch that adjusts how the automatic winding system works. 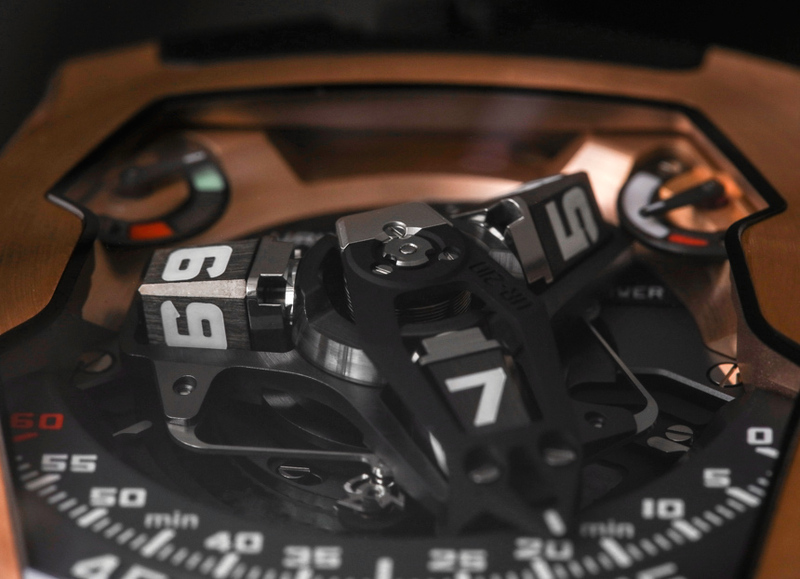 This latter feature isn’t unique to the UR-210, but isn’t present in all Urwerk timepieces. It is part of the in-house made UR-7.10 movement’s “Turbine Control” system and has three settings. 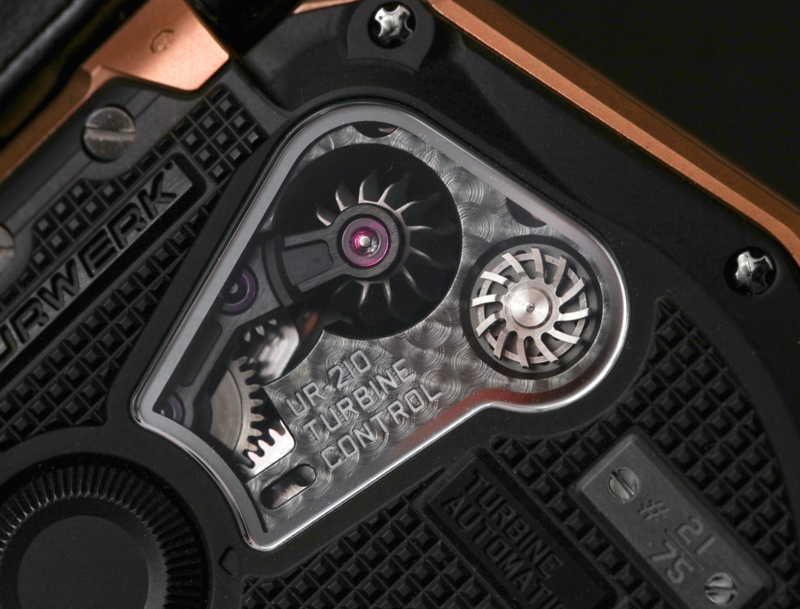 Urwerk refers to this system as a “winding efficiency selector” and its purpose is to allow the automatic rotor (not visible) to spin more slowly thanks to what I believe is increased friction, or to completely block the automatic rotor from winding at all – thus removing the ability for the watch to be automatically wound. Why might you want to change how the watch winds? In theory, to protect the movement from being damaged during shock. More recently, Ball watches came out with a similar complication they call their “Amortiser,” which also used a switch on the back of the watch to block the rotor from spinning. The utility for a complication such as this is limited, but in the right situations it can prevent damage to the fragile mechanical movement in the watch. My biggest problem with being able to manually stop the automatic rotor from winding the movement is that you need to think about it in advance of when your watch might be subjected to something such as shock. Say for instance you accidentally drop your watch and with the rotor blocked, the watch would not suffer damage to the movement… you’d have to anticipate that in advance of dropping the watch so that you can set the winding system to the right mode. Clearly, this complication isn’t about preventing accidents. 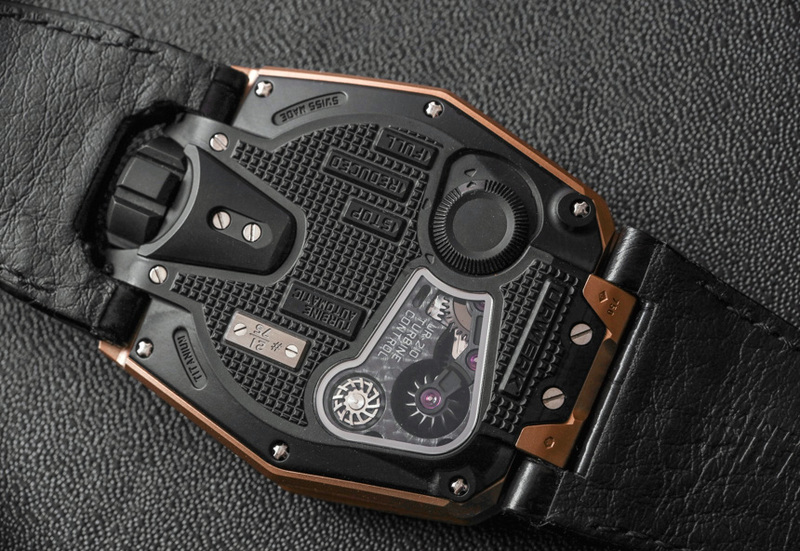 Urwerk is instead imagining a relatively niche scenario when you anticipate the watch being subjected to shock, yet can’t be compelled to simply not wear the watch. If you are going to be playing tennis or golf and want to protect against that type of shock, but still want to wear your Urwerk, then that is a good example of when to totally block the rotor. Are you mountain biking or riding in roller coasters? Those might be situations to reduce the winding efficiency of the movement. 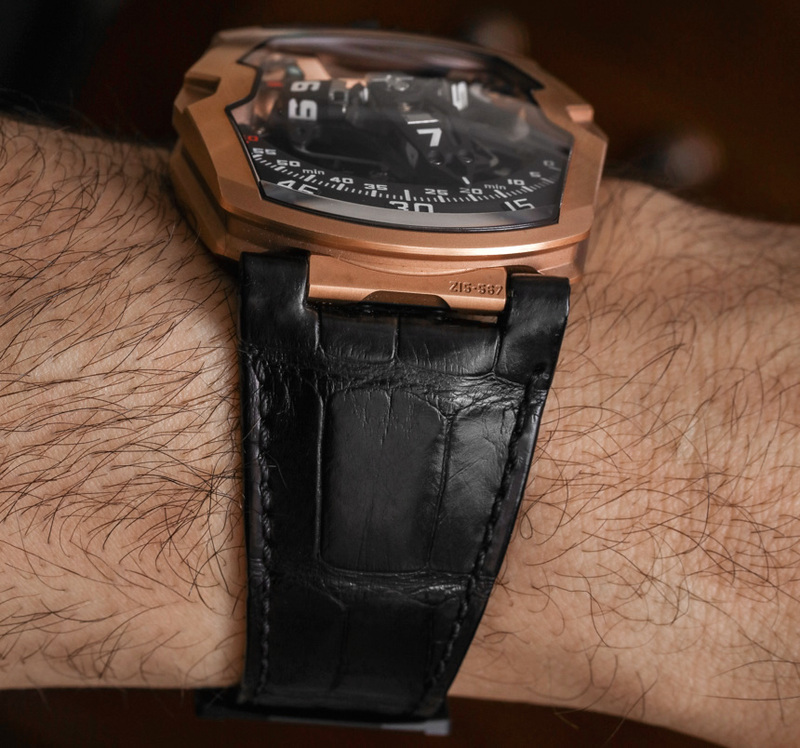 While I’m not saying this complication is mostly for novelty value, I’ve simply not put myself in the “F you world” position of wanting to do something that would be dangerous to a mechanical watch, and yet stubbornly deciding that I need to wear a $150,000 timepiece on my wrist despite what logic dictates.